100% whole-grain spelt and made with a sourdough starter, this yeast-free, preservative-free, whole-grain crisp bread with is sure to make you smile. 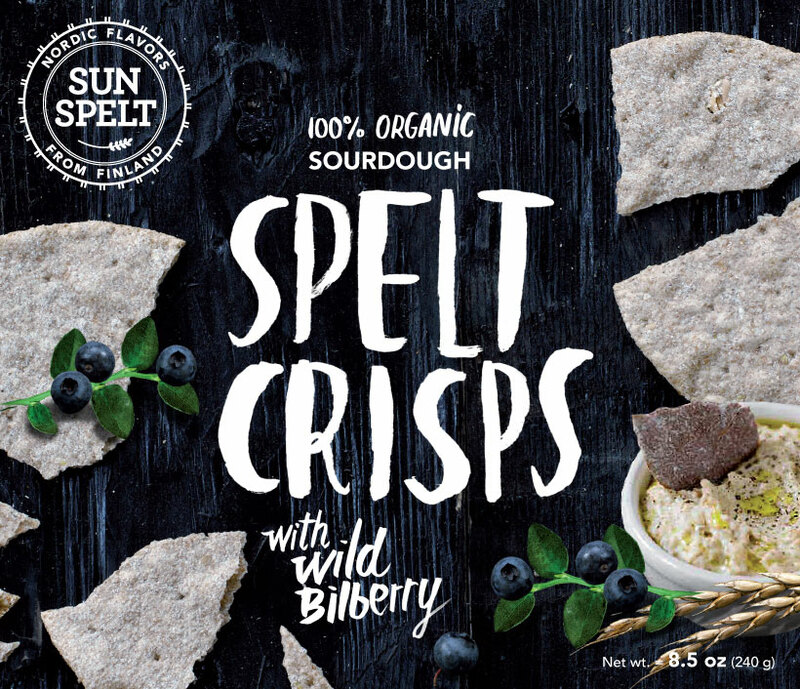 Rolled extra thin and baked to crunchy, delicious perfection, SunSpelt’s crisp bread will go well with your next meal, as a midday snack served up with a few slices of avocado, or as part of your appetizer spread. Wild Bilberry powder from bilberries grown in the clean, pure forests of Finland make this product extra special and extra nutritious. Back home in Finland, we like it topped with cold smoked salmon, but why stop there? Your imagination is the only limit. This spelt treat is crispy, delicious and perfect for every meal. Wondering how to use these in your kitchen? Try these alongside our Spelt Hummus, or take a look at the recipes under our Recipes tab for more delicious ideas.